Yikes! It’s been over a week since I took some time to blog. As I have mentioned before, I work at a local university, and the first few weeks of classes are absolute madness. This fall semester has been no exception! There is a universal guideline associated with every exercise or weight loss program I’ve encountered, and I’m sure you’ve seen it too. It usually goes something like this: “Please consult a physician before starting this or any program.” Sounds pretty wise to me. I probably hadn’t had any blood work done since I had my gallbladder taken out six years ago. I very rarely get sick, so I assume that I’m a fairly healthy person, but I figured it would be a good idea to have some baseline tests run. So two weeks ago, I went to have a physical at my doctor’s office. I’m pretty sure the last time I had a physical was when I was playing softball in high school, which has been…um…some years ago. I won’t say how many. I wanted to visit with my doctor about THE PLAN to make sure it is solid and sound. She said she thought I was on the right track, and we discussed developing healthy habits. Because I was still having those awful shin splints at the time, she also suggested I take two weeks off from running. Earlier this week I got the results from my blood work, and everything looks good! My blood sugar was great and all my metabolic results were within normal ranges. Today marks the end of my two-week hiatus from running, and I can’t wait to put on those new running shoes again and get back to my walking/jogging routine! I hate that I missed two weeks due to shin splints caused by poor shoes. My doctor advised going back to square one and increasing my running gradually, and I will follow that advice. I don’t want to end up hurting again! 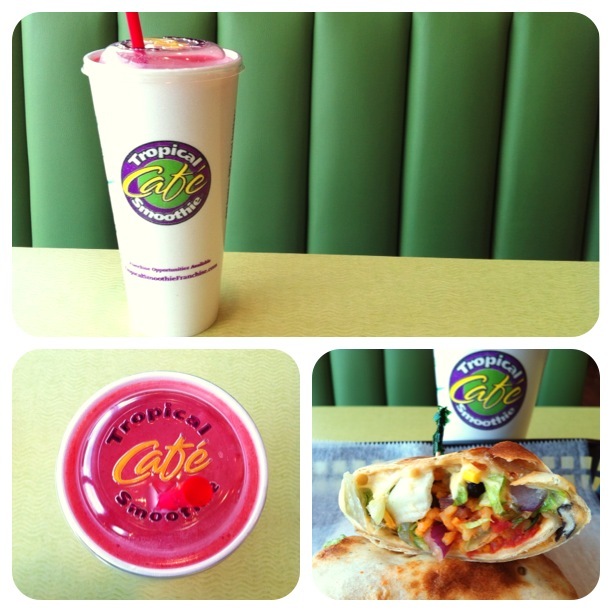 In other random news, I ate at Tropical Smoothie Café today. Things have been so busy at work that I have not eaten there in over two weeks. That’s a new record for me. I usually eat lunch there once a week, then have a light dinner that evening. It’s worth the splurge every time. :) I love that as long as I’m exercising, I can eat Tropical Smoothie and still lose weight. Makes this whole “new lifestyle” thing a cinch.